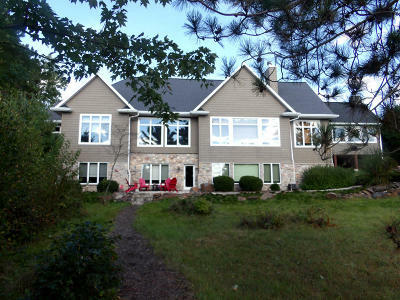 Exceptional, Custom, Executive Contemporary Style 5 Spacious Bedrooms, 3 Bath Home. Exterior Stone & Cement Shake Style Sided, Multi Gable, 4 acres with 200 ft. of sand bottom frontage on Prestigious High Falls Flowage. Southern Exposure. 3 Full Wall, Stone Fireplaces, Foyer with Open Staircase to Finished Lower Walk Out Level, Southern Exposure, Pier. Kentucky Blue Stone Flooring. Granite, Wood Flooring, Carpeting. Radiant Floor Heat, LP Gas Forced Air, Roman Shower, Steam Shower, Tongue / Groove, Finished Drywall, Security System, Up Grade Appliances, Generator, Central Air, Radiant Floor, Renew & April Air, Forced Air, Central Vac, Softener. Outdoor stone grill, Exterior Flood LightsAttached 28 x 30 plusDetached 40 x 50 Loft - Garage.A Must See to Appreciate!